When I first found myself back in the saddle as an adult, the first challenge was finding the right bicycle for my needs. The six month search (which you can read about in this blog post) involved hours of googling for reviews, feedback from a number of cyclists and countless visits to bike shops in the Klang Valley, culminating in a two month wait for my chosen ride to arrive. 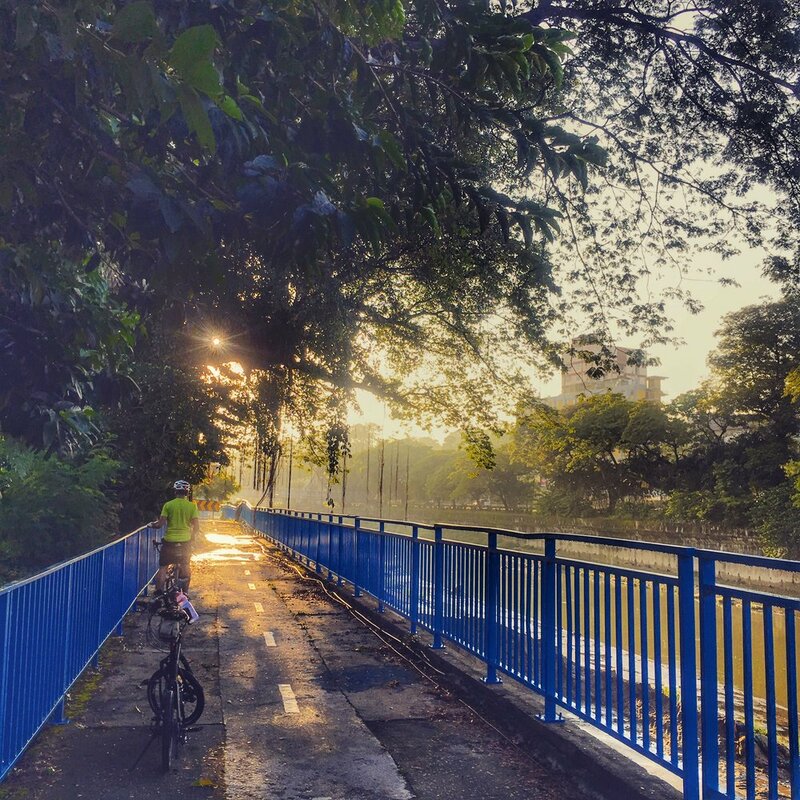 Where to cycle in Kuala Lumpur? Once my Birdy folding bike reached Malaysia, the real search began for the right cycling locations. Living at the edge of the Kuala Lumpur city centre meant I am in the heart of the concrete jungle, which means navigating the hilly terrain of the Klang Valley, dodging motorised vehicles, and timing our rides to avoid the searing heat of the local climate. Cycling activity in it’s many forms has been increasing in popularity over the last decade, and the authorities are still playing catch up when it comes to the relevant infrastructure. KL as the residents call it, and the larger Klang Valley area are trying their best to adapt to the changing mindset of the urban population. Many websites and blogs will say cycling is great in Malaysia, but they won’t recommend exploring the capital and surrounding cities on bicycles. The funny thing is, thanks to the existing two-wheeled traffic, cyclists can use the many motorcycle lanes that snake through the Klang Valley, while the attitude of drivers towards sharing the roads are slowly changing. Frankly speaking, I spend a fair bit of time cycling in the city centre, and it is possible as long as you adhere to the necessary etiquette to share the roads with motorised vehicles. Practice caution as always. I have been honked at now and then, but there have never been any instances where my life was in actual danger. There is a lot of the country’s cultural heritage to be seen in KL, where many buildings from the colonial and pre-war periods still stand. KL City Hall or DBKL for short also encourages cycling via KL Car Free mornings, twice a month on the first and third Sunday. This is a good way to dip your toe in before going the whole hog. Here's a link to the 2017 KL Car Free schedule. Flag off is at 7am, after which you can enjoy a 7km route that begins and ends at the DBKL building, passing through a number of roads, with the Petronas Twin Towers at the mid-way point. If you feel that the entire route is too far, you can start with a shorter loop of the same ride. The roads officially re-open to cars at 9am, but many days they will be re-opened in stages from 8.30am. You can continue cycling beyond 9am at your own risk if you can brave the traffic, which many cyclists do on the day, including myself. Pit stop in front of the Petronas Twin Towers. Here's a gallery of our favourite snapshots during our KL rides, as well as the administrative centre of Putrajaya. For those without their own rides, OCBC Bank offers a free bike rental from 6am, for those who can produce the local MyKad or passport as identification. There are only 140 available, so be there early to get in line, or alternatively 8am appears to be when a number of the bikes are returned. Take note that the pick up point was initially situated at the OCBC building itself, but has since been moved to DBKL’s headquarters. Another thing to remember, is that these bikes must be returned by 9.15am. Taking all this into consideration, the irony of having to drive into the city to get a rental bike for a few hours of cycling on urban roads is definitely not lost on me. The LRT trains are not yet running before 6am, but perhaps that is something the operator Prasarana will consider implementing to complement the eco-friendly message of KL Car Free. In the meantime, parking can be found in the areas around the starting point at DBKL. If you’re unsure of where this is, head to Dataran Merdeka, or Independence Square, and follow the crowd and the music. For city folk who have their own bikes and want to get there by bike, the Southwest Dedicated Bicycle Highway is the best way to remain car-less the whole morning. I live some 5kms away from the start of the bike lane; a mostly downhill ride from my home in Bangsar South. The bike path is accessible from the Federal Highway on the KL-bound side, between the Bangsar exit and MidValley Megamall itself. It is clearly situated right behind the MidValley KTM train station. Anyone living farther out can access the bike path via the motorcycle lane. Early morning on the bike path. However, a note of caution to take utmost care when you are cycling in KL to avoid any possible accidents. Besides a horde of other cyclists, there will also be people walking, running, skateboarding, rollerblading, and a number of other activities. There will be fixie riders and little children who do not cycle in a straight line. In addition to them, you will share the road with horse drawn carriage rides, and sometimes a marching band. Medics will be on hand to treat any injuries, but not all security personnel on duty will be familiar with first aid and medical emergency SOPs. Overall, KL Car Free morning is generally a fun event, with music, group exercises, t-shirt giveaways, lucky draws, and a number of other things depending on the weekend. 7km ride in the city centre. Start your ride through the cityscape of Kuala Lumpur from Dataran Merdeka. Enjoy the views along Jalan Raja Laut, Jalan Dang Wangi, Jalan Sultan Ismail, Jalan P. Ramlee, Jalan Ampang and Jalan Tunku Abdul Rahman. Have breakfast. Once you finish your ride, the KL Food Truck Feast is waiting for you at Dataran, with a range of both western and local cuisine on offer. It’s a nice way to end the morning, but you can also keep riding! Cycle on to the Perdana Botanical Gardens and Bukit Tunku. 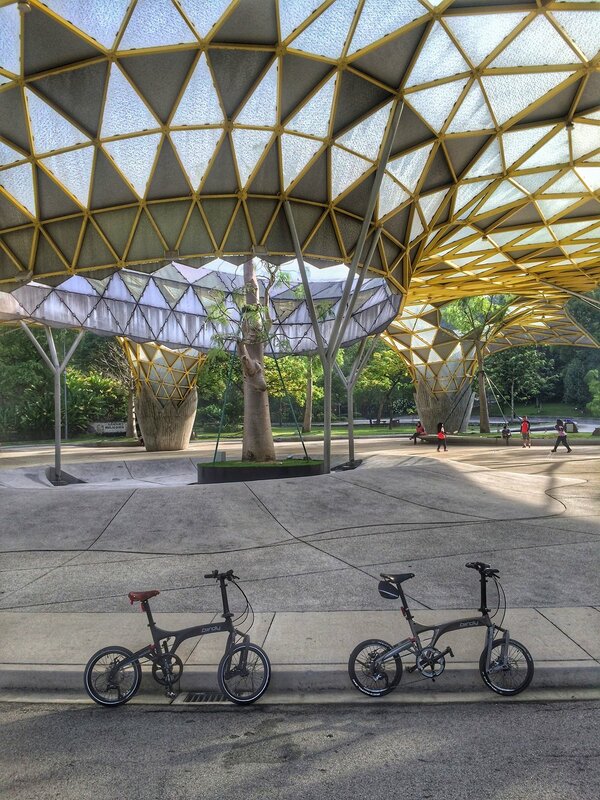 You could also opt to head to the Perdana Botanical Gardens for a shorter ride through the park. For more of a challenge, head to Bukit Tunku for the uphill climb to Tugu Negara and the Cenotaph. Go the long way in from Bank Negara, although there are no signs to the popular tourist spot on the other side. Just remember to turn left into Persiaran Sultan Salahuddin if you are coming uphill from Jalan Sultan Salahuddin. Guided group rides. For those interested in a 40km ride that starts from Petaling Jaya, the folks at Van's Urban Bicycle usually arrange a group ride into the city during KL Car Free days. This is a great way to get acquainted with the motorcycle lanes and how to get to the actual bike path itself and head into KL. The skate park at the Perdana Botanical Gardens. The bigger question is, does this event highlight the need for more cycling infrastructure in KL and the Klang Valley? Absolutely. When I first began cycling I was employed at a local independent radio station BFM89.9, which despite branding itself as a business station, covered a range of content ranging from news, politics, current affairs, culture, and to of course, music. I explored the issue of urban cycling in a Current Affairs show in March 2016, the podcast for which you can download here. The show pre-dates keirin specialist Azizulhasni Awang’s bronze medal at the Rio Olympics, Malaysia’s first cycling medal at any Games, which will surely fuel the popularity of the sport. I was also a guest on the station’s late night Malay-language show Bila Larut Malam to talk about the different forms of cycling in the city and the burgeoning culture. For those who speak or understand Malay, you can listen to the conversation here. Last year was also the beginning of my association with Cycling Plus Malaysia, for which I am now a regular columnist. I’m glad to say that cycling is today a growing movement in KL, leading to the creation of a crowd sourced map of routes in the city. If you’re not in town on a KL Car Free sunday, or don’t mind being confined to the heritage area and tourist trail, there has been a KL By Cycle tour. We've heard of really bad reviews of the service however, so the best you can do is use it as an itinerary for a self-guided tour. For a more personal tour on two wheels, Elena Mei Yun offers two different routes in the city, somewhat off the beaten path. You could also contact our local cycling advocate Jeffrey Lim, who knows many hidden nooks and crannies in the city. I hope that’s enough information to have piqued your interest. Perhaps we’ll bump into each other on the roads in KL sometime!